In the world of Education, we often talk of holding ourselves and adhering to “high standards,” and in order to ensure we are meeting these high standards, students take carefully written standardized exams at the state and national level. These tests are then used to determine the efficacy of our schools, curriculum, and teachers. Now, with more and more states tying these scores to value-added teaching, these tests are having more impact than ever. 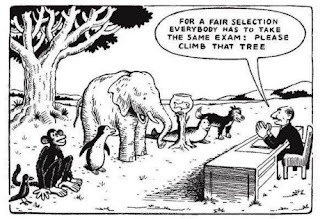 But being so tied to the standards can be a detriment to classroom learning and national educational success. Dr. Pasi Sahlberg of Finland spoke at Indiana University on January 20, 2012 to discuss accounts of Finnish educational excellence in publications like The Atlantic and the New York Times, and promote his new book, Finnish Lessons: What Can the World Learn from Educational Change in Finland? One of his main points was that the constant testing and accountability to which the U.S.'s students and teachers are subjected do not raise scores. He argued that frequent testing lowers scores because teachers must focus on a test that captures numerous little things, rather than delving more deeply into a smaller number of topics. This point addresses an important discussion that needs to occur: while we push for educational reforms, the reforms are largely the same old ineffective practices with new names. Linda Darling-Hammond makes this point eloquently in The Flat World and Education: How America’s Commitment to Equity Will Determine Our Future. States across the nation are adopting the Common Core Standards. These new standards are certainly an improvement over the patchwork quilt of obsessively detailed state standards that they replace. But the manner in which these standards are used to shape practice may be devastating. There are so many standards to be covered within one year of one subject, and within each standard are several skills to be addressed. Perhaps we are asking schools to focus on too much in a short amount of time. Dr. Sahlberg made this point by sharing that Finland teachers focus on a few skills deeply, rather than many skills shallowly, and students are tested once – at the end of their senior year. The result: Finnish students are making top scores on the PISA survey and generally scoring high in most subject areas. Now, Dr. Sahlberg was quick to point out that we mustn’t think that we can take Finland’s system, implement it in the U.S., and expect it to suddenly raise achievement. Of course that won’t work. But what we can do is have a conversation about our approach to assessment, how we (appropriately and inappropriately) use the results of the assessments we take, and what we might learn from others who are experiencing success. Having this conversation does not mean that the United States is inadequate – it means we are smart, that we are reflective, and that we realize there is a problem and that we need to fix it. Thanks for this comment. The article you posted is excellent. One of his points addresses the quality of teachers and teacher training programs, and this is a very important part of this conversation. There are so many different ways to run a school, but if the teachers are not trained well, do not have opportunities for effective professional development, lack time for collaboration, and/or do not feel appreciated or motivated to continually improve and innovate, the more cosmetic repairs we try to implement will not help improve academic success. I remember being shocked when I first learned that none of my colleagues (save one) in the English department - all of whom teach writing - write themselves. I was further shocked to learn that the library clerk doesn't like to read, and had not read most of the books she was passing out to students! Teachers have a lot on their plate, and there seems to be a general resistance to change and to making time to collaborate, perhaps because change is scary, but also perhaps because the changes mean more time and work, and teachers already feel overloaded and under appreciated. Even so, we did not become teachers for fame or fortune; we became teachers to educate future voters and citizens, and I think it is is in all of our best interests for teachers to have the rigorous training, for useful professional development opportunities, and to feel like what they do matters. This why something we are working on now is developing professional development opportunities that are engaging and effective, but that is something for another post. When you are done with your piece on professional development, I would very much like to read it! High school staff development is one of my responsibilities, and while I have the staff involved in helping me make it a worthwhile learning process, I feel there is so much room for growth. It's a tricky thing to take 105 teachers and make them magically grow in one day of training. I remember sitting through PD and wondering how any of it might actually help! We are focusing on RTI and how differentiated instruction and assessment helps students at all levels, from EL to AP and all of the students who are missed in between. Thanks for posting, do you mind if I use some of your work as a discussion piece?